Jason Box: Can We Save Greenland? Jason Box is one of the premier experts on the Greenland ice sheet, having spent, in total, more than year camping on the ice over the course of the last 2 decades. Dr. Box is the creator of the Dark Snow Project, an ambitious attempt to Crowd-fund an arctic expedition this summer. 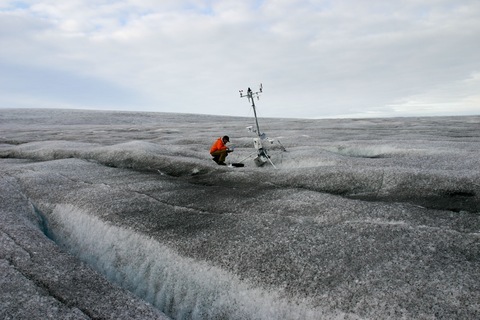 Over the last decade, Jason’s measurements indicate that the surface of Greenland has become darker, more absorptive of the sun’s light and heat. There are a number of processes that could be causing it – some natural, some manmade. DarkSnowProject is designed to sample snow at various points on the ice sheet, and determine if soot from increasing numbers of large wild fires could be one of the significant reasons for darker snow. Are wildfires speeding up ice melt in Greenland? Jason Box, founder of the Dark Snow project, is taking up a collection to find out. Last summer, record-setting wildfires raged across Colorado and New Mexico. It was the third most devastating wildfire year on record in the U.S. Warmer and drier temperatures in recent decades has also led to increased fire activity in the Arctic tundra. The Anaktuvuk River fire in Alaska in 2007, for example, burned 401 square miles, an area the size of Cape Cod. It was the largest tundra fire ever recorded. While forests and grasslands burned, the Arctic melted. Greenland’s ice sheet melted at a faster rate than scientists had ever observed, with 90 percent of the mass thawing in July. Box, who is a Greenland ice climatologist at the Byrd Polar Research Center, thinks there might be a connection between the wildfires and the unprecedented ice melt. Box is no stranger to Greenland. He’s made 19 trips to the country since 1994 to study the glaciers. He’s also been involved in the Extreme Ice Survey, a research and photography project that monitors the disappearance of the earth’s glaciers. WASHINGTON, D.C. — Sixty-seven percent of Americans would rather see the government tax carbon pollution rather than cut spending as a way of solving our budget problems. This is the result of a national survey of 1,000 voters by Mellman Group, a leading polling firm. It was conducted last month, at a time when raising taxes on wealthier Americans was being hotly debated. 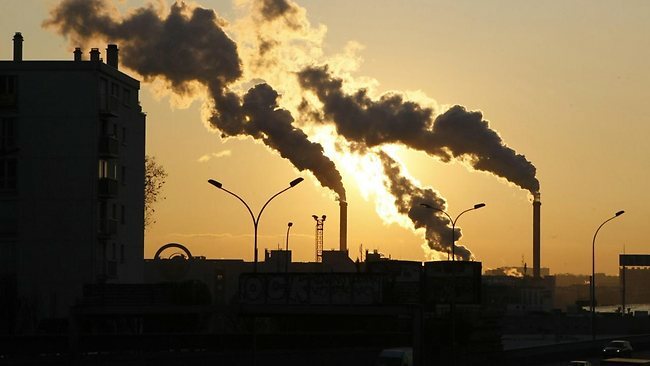 Even a modest tax on carbon dioxide pollution, like that proposed by Representative Pete Stark (D-Calif.) in 2009, has the potential to generate substantial revenue: Stark’s tax, for example, could have yielded $80 billion in the first year alone, and $600 billion over 10 years. That is about half the amount that the automatic spending cuts ($1.2 trillion) would save over nine years, less if part of the revenue were refunded to consumers. Compared with taxing carbon pollution, only 15 percent of respondents favored cutting government spending as a way of solving our budget problems. Voters’ strong support for carbon taxes do not differ greatly based on how the revenue would be used: whether to help solve our budget problems (70 percent in favor), or to help solve our budget problems as well as fund climate and clean energy jobs programs (72 percent in favor). Support for a carbon tax was high among Democrats (93 percent in favor) and Republicans (66 percent) alike. The survey was conducted between December 16-19, 2012, by the Mellman Group, two-time winner of “Pollster of the Year” by American Association of Political Consultants. The survey polled a scientifically selected random sample of 1,000 adults from throughout the United States. All voted in the 2012 presidential election. The survey was balanced between men and women, and between those who described themselves as Democrats versus Republicans, and liberal versus conservative. The margin of error associated with this survey is +/– 3.1 percent. Carbon Tax Idea Takes Hold in Heartland. Great Minds thinking Alike? or Emerging Strategery? During a short trip to DC early this week, I had the chance to interview Chris Mooney, above, on how Washington is processing President Obama’s sudden change in tone on climate change. Meanwhile, the basic idea of setting a price on carbon has been steadily working its way into the mainstream conversation…almost like there was some kind of over-arching communication strategy…. The White House has ruled out proposing a carbon tax. Mooney points out that the president has a lot of levers to pull short of pricing carbon. Three dimensional chess masters, assemble. If Congress and the president were more rational than political — admittedly, a very big if — they could kill a covey of birds with one stone. They could replace the payroll tax with a carbon tax. Suddenly, Social Security and Medicare funding would be secure, which means the rest of the fiscal crisis would be fixed. Plus, you might save the planet in the process. Instead of paying combined Social Security and Medicare taxes of 7.65 percent through payroll deduction, workers would keep that money. They’d need at least part of it to pay for the carbon taxes on gasoline, natural gas and electricity produced by coal or gas plants. For example, if oil companies were taxed $20 a ton for the carbon dioxide their products created, they’d pass along the cost to consumers. The price of gasoline would go up about 20 cents a gallon. Consumers, eager to save money, would look for ways to reduce their carbon use. Entrepreneurs, eager for ways to cash in, would look for ways to help them. Instead of a regressive flat tax on payroll, the carbon tax would be more efficient consumption tax. Slowly, perhaps imperceptibly at first, carbon emissions into the atmosphere would be reduced. 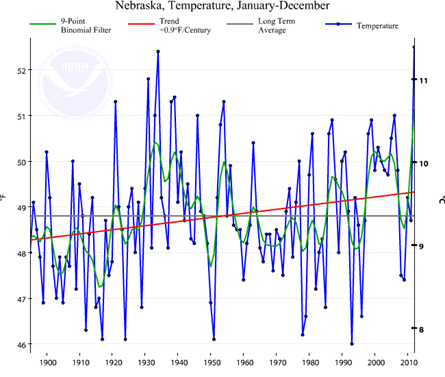 The temperature of the atmosphere would not go up so fast, perhaps stabilizing enough to avoid worldwide catastrophe. The Earth might be habitable for our grandchildren. Liberal economists like the carbon tax. Conservative economists like the carbon tax. Environmentalists like the carbon tax. So why not do a carbon tax instead of fooling around with spending cuts, tax expenditures, payroll taxes, plan Bs, sequestration and all the rest of the fiscal cliff discussion? The president, in his first term, was not idle. Fuel-efficiency standards are mandated to rise to 54 miles per gallon by 2025, the Environmental Protection Agency is now applying the Clean Air Act to carbon dioxide, and nearly $100 billion in stimulus funds went toward development of clean energy. But much more is required, and Congress must be on board if the country is to meet Obama’s modest 2020 target for reducing carbon emissions by 17 percent, and 80 percent by 2050. For that to happen a carbon tax is vital. It is also essential that the United States assume a leadership role in reviving international climate talks aimed at a global strategy for arresting the rise in carbon dioxide levels that, if unchecked, will overwhelm future generations. With his call to action, the president has taken an encouraging step that will require many more from him and from all Americans. There is, quite literally, no time to waste. He tried and bombed on promoting a cap-and-trade measure in 2009. Good summary of how coal barons extract coal from public lands, paying virtually nothing for the resource, and are planning to expand their markets overseas, even as coal continues to shrink as a share of generation in this country. Video: Stop the Keystone Pipeline. Stop Tar Sands Development. This video discusses the importance of stopping development of Canadian tar sands, which might be the single most destructive industrial project ever attempted. In watching it, I was reminded of Colin Powell’s formulation for dealing with the Iraqi army. 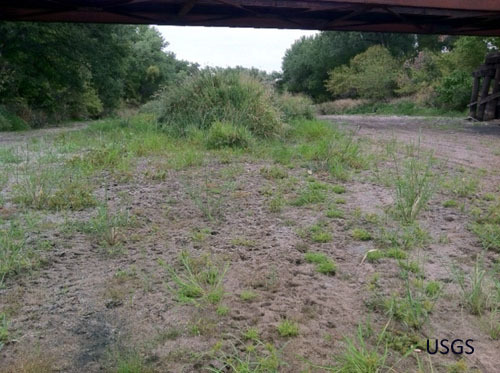 Republican River Runs Dry. No – Really. I could have titled this “A River Used to Run Thru it”. The metaphors write themselves. Follow along with me. 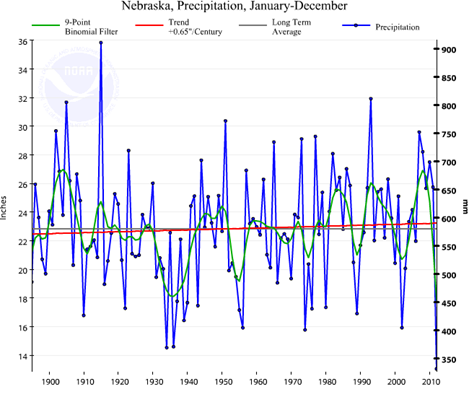 Nebraska had its driest year on record in 2012. 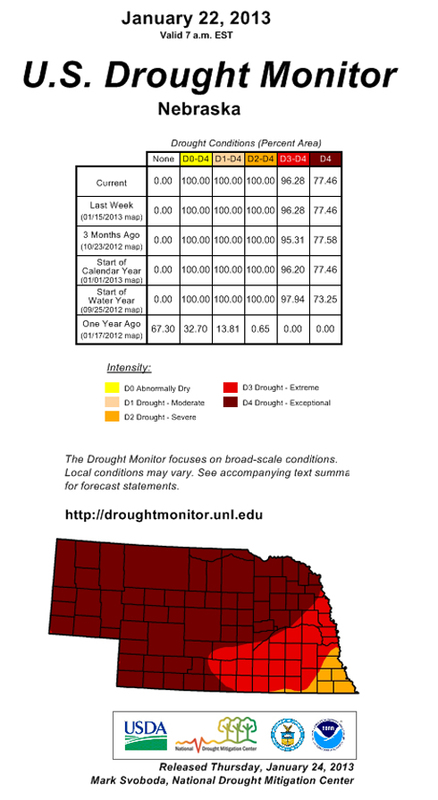 (D3-D4 drought, bright red and dark red on the map). 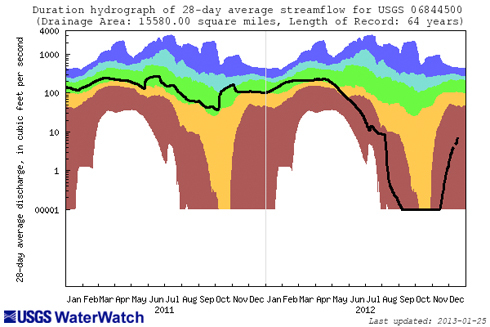 Below: Streamflows for the Republican River near Orleans, Nebraska. Which would all be very amusing except, it’s not a metaphor, it’s not a spoof, it’s not The Onion – it’s where we are in 2013, and another indicator of where we’re headed. Reader Neven sends along a reminder that there is more than one way to green a desert. I think I’ve posted this before, but worth more than one look. Reader Marc McNaught writes me that he has been using the Sahara Forest technology at Sundrop Farms down under for some time.